So excited today to be guesting with Winnie & Walter for this month's Rerun post! This month the team is featuring Welcome to the Family with Evelin T Designs! This adorable set is full of the cutest images for many occasions. My card is a congratulations card for a new baby using purple as the anchor colour because it can be for either a boy or a girl. 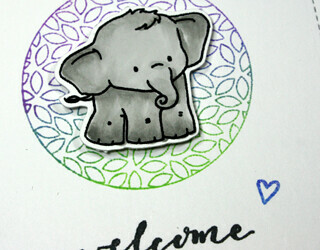 I stamped and die cut the little elephant from the set and Copic coloured it. The background circle behind the elephant was stamped using A Tree for all Seasons using Hero Arts Ombre Meadow ink. The Rerun posts are to provide new inspiration using the featured set along with a challenge through the end of the month, a sale on the featured item for the entire month and one random commentor on the blog post at Winnie & Walter will win the stamp set! Make sure you head over to the Winnie & Walter blog for your chances to win! Both of your cards are adorable, Tracey! So glad to have been a part of this with you! Oh, Tracey...there you go making two cards! And of course both are adorable!! Love your sweet, soft colors on them. And how fun it is to see cards from the SA group. Just like still sitting next to you this week (making my withdrawal more tolerable for sure). Miss you...can't wait to stamp with you again! Darling cards Tracey. BOth would make any new mama smile. Tracey both are just as sweet as can be! I am particularly in love with your little Ellie! Both of your cards are absolutely darling, Tracey!!! Love how you stamped the leaves behind the elephant! And your layout for the giraffe card is fabulous!! Have a great weekend! YAY, so happy to see you guesting Tracey! Your cards are adorable and extra sweet!